While the role that some places have played during war has made them foci for legitimate commemoration of historical events, acquisition of this cultural heritage dimension has often occurred at considerable cost to natural heritage values that previously existed. 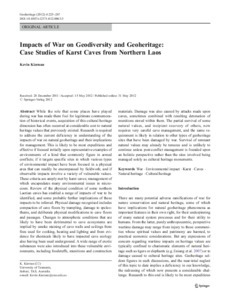 Research is required to address the current deficiency in understanding of the impacts of war on natural geoheritage and their implications for management. This is likely to be most expeditious and effective if focused initially upon representative examples of environments of a kind that commonly figure in armed conflicts; if it targets specific sites in which various types of environmental impact have been focused in a physical area that can readily be encompassed by fieldwork; and if observable impacts involve a variety of vulnerable values. These criteria are amply met by karst caves; management of which encapsulates many environmental issues in microcosm. Review of the physical condition of some northern Laotian caves has enabled a range of impacts of war to be identified, and some probable further implications of these impacts to be inferred. Physical damage recognised includes compaction of cave floors by trampling, damage to speleothems, and deliberate physical modifications to cave floors and passages. Changes to atmospheric conditions that are likely to have been detrimental to cave ecosystems are implied by smoke staining of cave walls and ceilings from fires used for cooking, heating and lighting and from evidence for chemicals likely to have impacted cave ecology also having been used underground. A wide range of exotic substances were also introduced into these vulnerable environments, including foodstuffs, munitions and construction materials. Damage was also caused by attacks made upon caves, sometimes combined with resulting detonation of munitions stored within them. The partial survival of some natural values, and incipient recovery of others, now requires very careful cave management, and the same requirement is likely in relation to other types of geoheritage sites that have been damaged by war. Survival of remnant natural values may already be tenuous and is unlikely to continue unless post-conflict management is founded upon an holistic perspective rather than the sites involved being managed solely as cultural heritage monuments.